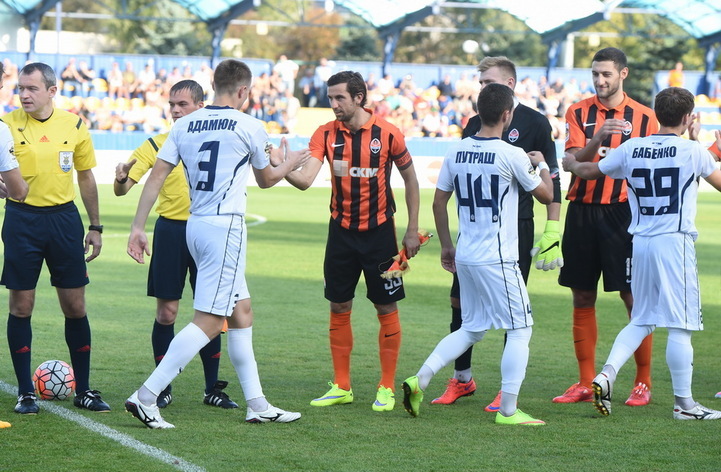 On September 19, Shakhtar faced Stal Dniprodzerzhynsk. After the Tuesday game with Real Madrid in the Champions League, the Pitmen’s head coach Mircea Lucescu held the squad rotation. Bohdan Sarnavskyy, as well as Ivan Ordets, Vyacheslav Shevchuk, Maksym Malyshev, Dentinho, Bernard and Eduardo were fielded in the starting line-up. The game took place in Kyiv at the Bannikov stadium and caused decent interest among the fans. The Pitmen took control of the game and orchestrated a number of attacking moves. As early as on 10 minutes, the scoring was opened: Fred fired a shot from distance, the ball took deflection off Eduardo’s back and flew into the net – 1-0. Shakhtar continued piling on pressure. Soon excellent shots from outside the penalty area were taken by Yaroslav Rakytskyy and Alex Teixeira (the visiting goalkeeper made saves), and following a header from Eduardo the ball flew just wide of the goal post. On 30 minutes, Teixeira could have scored but his header was parried away by the goalkeeper. Soon Eduardo failed to get on the end of Darijo Srna’s cross, and in the next attacking move Eduardo fired just wide from outside the penalty area. The ball very rarely reached the penalty area of Shakhtar, but on 41 minutes Sarnavskyy had to rescue the team after a shot towards the top corner. In the end of the first half, Teixeira scored his 10 goal in the eighth match: after a cross from a corner the Brazilian got on the rebound to make it 2-0. During the half time break, Mircea Lucescu made a change, fielding Viktor Kovalenko. Shakhtar continued attacking. Stal became energetic, midway through the second half, the visitors created two dangerous chances. Shakhtar’s head coach tried to freshen the game up with substitutions: Marlos and Taison came on. On 72 minutes, Sarnavskyi parried away a shot that was flying towards the top corner, and soon again made a save. Stal were attacking in numbers, and the Pitmen tried to hit the opponents on the break. In the stoppage time, Taison fired a shot from outside the penalty area – into the goalkeeper’s hands. The scoreline remained the same before the final whistle. Thanks to a 2-0 win, Shakhtar are now equal on points with the league leaders Dynamo. Both teams now have 19 points, but the Kyiv side have match in hand. In the next round, 26 September, the Pitmen will face Olimpik Donetsk, and before that, on Wednesday, they will play a Cup game with in Ternopil against the local club.